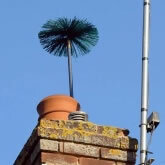 We provide a full chimney sweep service throughout Kent. We have been working in the Kent area for many years and have built up a regular client base through referrals and being customer focussed. If you live in the Kent area and are looking for the best chimney sweeps Kent has to offer then look no more, you have found the right company for your needs.